Have adjustable strap at top for tight fit. 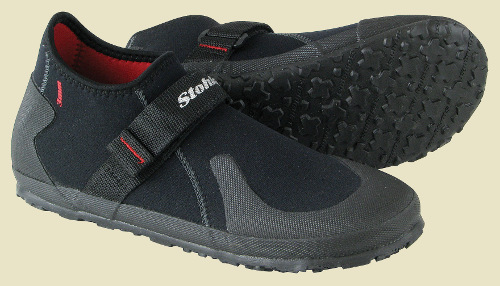 Great for wading in small streams and rivers where the water is not very deep. Whole sizes only (1/2 sizes go up one). Uniquely designed 3mm Nylon II neoprene sock. The strategically placed triple-glued and blind-stitched seams are comfortable and durable. The screened PU bottom tread provides an extra margin of protection from normal wear and tear. This 3mm neoprene water shoe is perfect for warm or cool water. A 5mm-thick all-terrain vulcanized rubber sole provides superior traction while the unique plastic midsole, coupled with a vulcanized rubber toe cap and heel counter, provides ultimate foot protection. An over-the-arch strap holds the foot in place while specially vented side panels allow water to drain out. The triple-glued and blind-stitched seams are comfortable and durable. A traditional moccasin design... for paddlers. 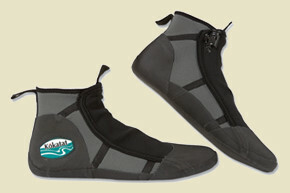 Brought full circle into a high tech neoprene sock for paddlers and stand-up paddle-boarders. Gives both intimate contact and foot control while paddling and fits easily into the smallest of play-boat front quarters. Unique Kevlar sole rolls up around the foot on all sides with a simple gathered seam in a style originating among the North American Indians. All assembly seams are set high so you're not driving them into the dirt with each step. • 3mm 4-way stretch neoprene panels at heel and instep. • Moccasin shaped durable Kevlar out-sole rolls up around the foot for unmatched durability. • Seams set high for added comfort. 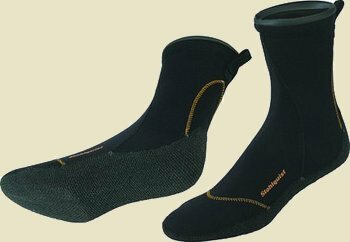 • Low profile fitting sock easily slides into a boater's tight interior quarters. • "O"-ring top seal keeps water and debris out. 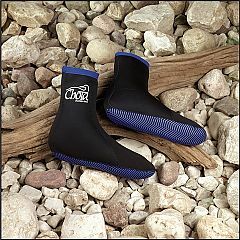 The Tideline paddling boots for men features a 5mm neoprene upper, heavy-duty zipper, and gusseted zipper opening which helps to reduce water exchange. The thick rubber outsole features a proprietary Stohlquist tread pattern for outstanding traction. The ergonomic shape, which echoes that natural shape of the foot, allows for the best possible fit and comfort in a paddling boot.The Ergo shape also helps to increase the overall warmth of the boot, by contouring the natural shape of the foot and minimizing water pockets. These are Men's Sizes! • Ergonomically shaped footbed for maximum comfort. • 5mm standard neoprene upper. • Non-corrosive #10 YKK zipper with velcro zipper lock. 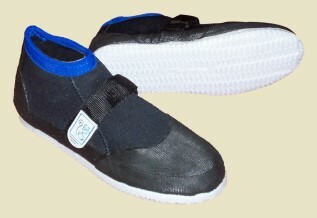 • Rubber toe and heel caps for added protection. 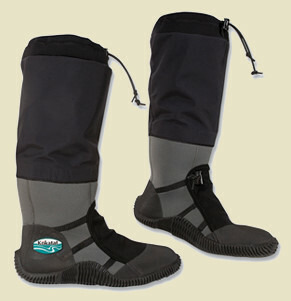 The Tideline paddling boots for women feature a 5mm neoprene upper, heavy-duty zipper, and gusseted zipper opening which helps to reduce water exchange. The thick rubber outsole features a proprietary Stohlquist tread pattern for outstanding traction. The ergonomic shape, which echoes that natural shape of the foot, allows for the best possible fit and comfort in a paddling boot.The Ergo shape also helps to increase the overall warmth of the boot, by contouring the natural shape of the foot and minimizing water pockets. These are Women's Sizes! • Ergonomically shaped footbed for maximum comfort. 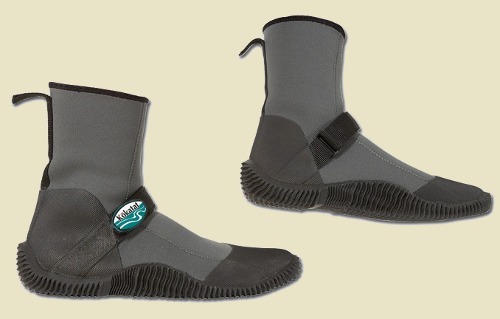 The low-top cousin of the Tideline bootie features a 3mm neoprene upper, 5mm neoprene insole, and hook & loop strap to keep them locked on when swimming. The thick rubber outsole features a proprietary Stohlquist tread pattern for outstanding traction. The ergonomic shape, which echoes the natural shape of the foot, allows for the best possible fit and comfort in a paddling boot. � Hook & loop security strap. 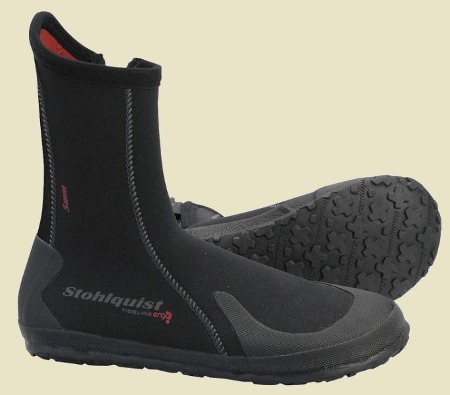 • Grippy PVC-free Octo-Sole provides excellent traction on wet surfaces. • Super Soft 5mm EVA sole for lasting comfort. • Nylon mesh panels for ventilation and drainage..
• Toe and heel bumpers for added protection on rocky shorelines. • Pull loop at heel allows for quick and easy entry. • Lightweight and easy compressible for easy packing. 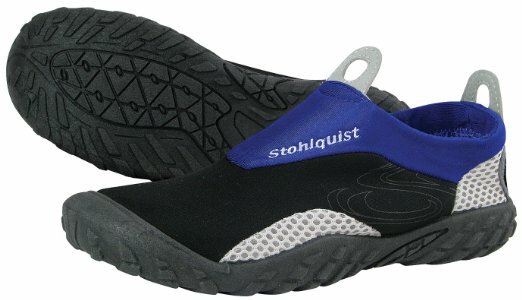 • breathable and fast drying toe-zone. This ultra-lightweight, highly flexible, low profile paddler's shoe is designed for use in whitewater play boats and low volume touring kayaks. The singlehand adjustable shock cord lacing system allows for precise volume adjustment and fit. A 0.5mm superstretch neoprene lace cover eliminates the snag hazard associated with other lacing systems. Made from 3mm double lined neoprene with ultra-thin vulcanized rubber sole, toe cap and heel counter, the seeker provides comfort, durability and enough protection for put-ins and portages. This innovative lightweight paddling boot offers the paddler a full-coverage boot that provides the necessary protection while launching your boat. Perfect for touring and canoeing, the Scout has an adjustable volume 3mm doublelined neoprene lower shoe with the same covered lacing system featured on the Seeker. A medium thickness outsole with stiffening insert and a vulcanized rubber toe cap and heel counter provide extra protection and support. This innovative lightweight paddling shoe by Kokatat offers the paddler a full-coverage boot that provides the necessary protection while launching your boat. Perfect for touring and canoeing, the Nomad has an adjustable volume 3mm double-lined neoprene lower shoe with our neat covered lacing system. The waterproof/breathable gaiter on the upper part of the boot allows for more comfort in variable temperature and weather conditions. An adjustable neoprene cuff secures just below the knee. A medium thickness outsole with stiffening insert and a vulcanized rubber toe cap and heel counter provide extra protection and support while being flexible for any paddling situation. Ultra-Soft closed cell rubber with mesh gusset for comfort all day. 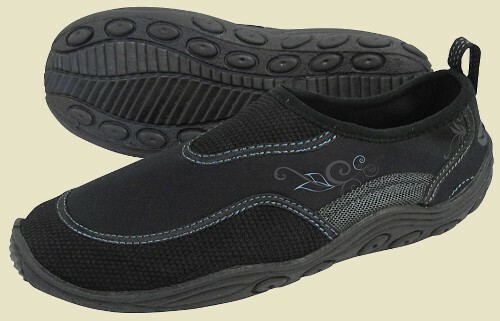 Flexible non-slip, non marking sole is comfortable to wear in or out of the water. Provides a convenient nylon finger loop for easy pull on entry. Good footwear is a must when you go paddling. You'll need to step into the water as you get in and out of your boat and the rocks and zebra mussels will be waiting! 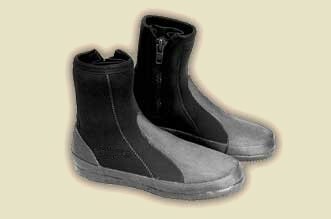 These side-zip neoprene boots offer warmth, protection and traction when paddling in lakes, rivers and creeks. BEST SELLER... now on SALE! Thick, 5mm Seeflex neoprene uppers are flexible and comfortable. Heavy-duty #10 medial zippers are backed by a fully gusseted water dam to reduce seepage. Full rubber randing with front vamp, toe and heel caps enhance stability, durability and protection. 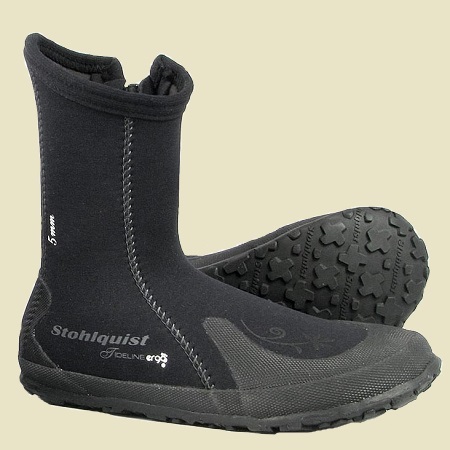 Extra-thick rubber outsoles provide traction on wet surfaces and offer much more protection from rocks or other debris yet are still flexible whether sitting or kneeling. Whole sizes only, typically worn barefoot but will accommodate a thin sock (1/2 sizes go up one).